ok, I know I'm a little ahead of the game here, but I'm just too dang excited. IT'S ALMOST CHRISTMASSSSSSSS. I've been waiting all year for the holiday season to roll around again, partly because I have all these great Christmas DIY projects I've been wanting to show you. I figured we'd start it off easy with these Christmas drink stirrers so that we can start swizzling those Christmas cocktails and get in the holiday spirit, amiright? These Christmas stirrers are super easy and super affordable. You can make them in your choice of colors, but I'm always a fan of pink so I chose a more modern color palette. I had actually made these last year for the blog, but the photos came out SO BAD that I couldn't bring myself to post them (see them here). So, I knew they had to be my first project this year. I gave them a slight makeover and a new color scheme, and voila! Ready to go. Directions: Take your wooden stirrer and put a dab of glue on the end. 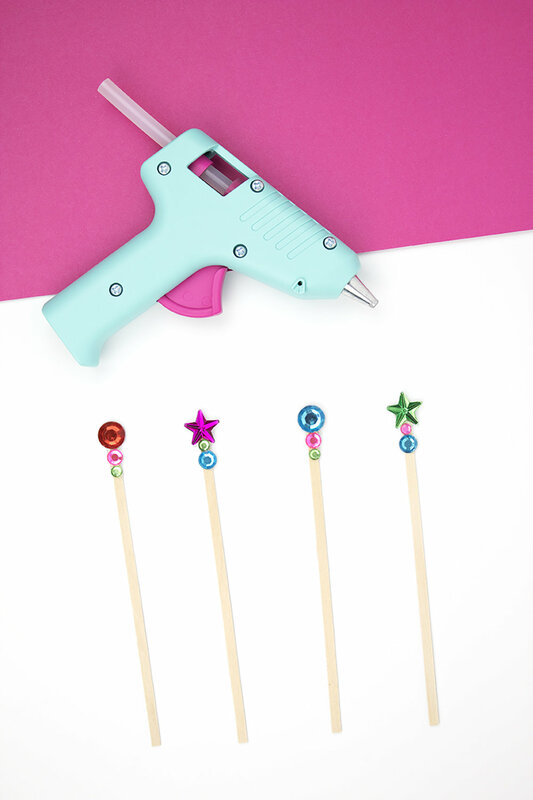 If your glue gun puts out a thick dollop, use a toothpick to put a small amount of glue on the back of the rhinestone or onto the stirrer. Place your large rhinestone at the top. Then, put 2 more of the small rhinestones underneath it. If you want it to look less home made, flip it over and repeat for the other side. 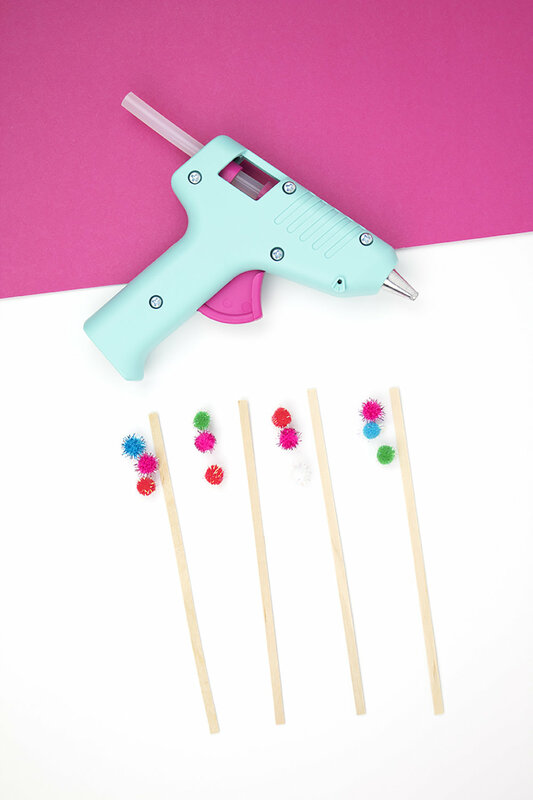 Directions: Put a dab of glue on one end of the stirrer, and pop on your pompom. Hold in place until it dries, then repeat for the other 2 pom poms. Easy peasy! 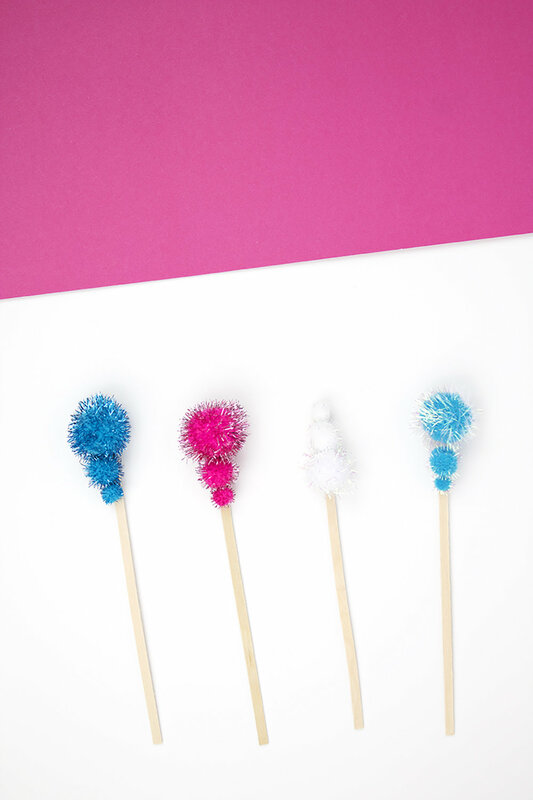 Directions: Glue the pompoms onto the stirrer in size order from smallest to largest. You can also glue your pompoms in the other direction if you want it to be festive instead of snowman. And there you have it! 3 easy ways to get festive with your drink stirrers for coffee, hot cocoa, and cocktails. These are perfect for any age, and they're disposable! You could even use them as drink markers, depending on how many people you have since each one can be different. And, since you can mix and match the colors, you can make these to match any holiday or event. I'm SO excited for all the posts coming to the blog in the next few weeks. There are some really good ones headed your way!! So, which drink stirrer would you grab for your drink? And what drink would it be? Let me know in the comments below!